Finding the best Lake Mary plumber should not be a difficult or cumbersome task. 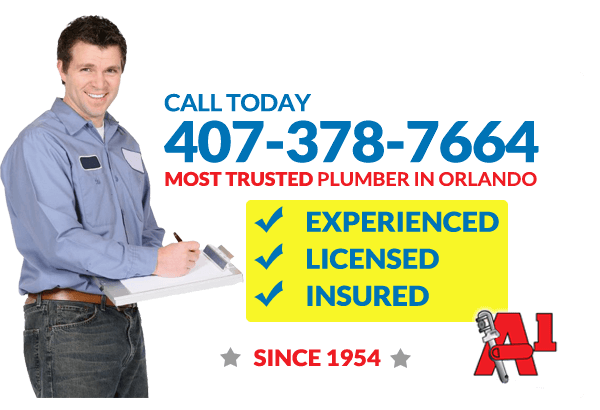 A1 Plumbing Service is one of the most popular Orlando Plumbers. With over 50 years of service, we have the reputation and history of being the premier plumber in Lake Mary. Many people want to hire A-1 Plumbing because of our range of services from residential plumbing to Commercial Plumbing. This company is rated with A+ rating score by the Better Business Bureau (BBB) association. This rating score shows that through the years we have obtained top scores due to our attention to detail and emphasis on customer service. Are you having issues with the plumbing system of your home? Is your toilet broken? Are your pipes busted? Do you have a clogged drainage system? Are you having issues with your septic systems showers, water heater, and tubs? Are you in need of Emergency Plumbing in Lake Mary? Our team of expert and professional Lake Mary Plumbers are only a single phone call away. A1 Plumbing Service is an expert Orlando Plumbing company that specializes in anything plumbing related. We offer 24 hour Lake Mary Plumbing services including water heater specialist, re-piping service, hidden leak detection, camera line reparation, lavatory sink evaluation, backflow testing, pipe installation, and many other services. We service all of Seminole and Orange County, for extra savings check out our coupons section today. Plumbing repairs can be handled both during the day and even at night. We are always available no matter when your plumbing issue arise. Our well-experienced Lake Mary plumbers will definitely be able to get it fixed. We are here for you day in and day out, all around the year. We are ready to work all round the clock to get your plumbing system working well. We can vouch for our team of experienced Lake Mary plumbers, and the type of services they will offer. Our expert plumbing company has been known all over Lake Mary, Florida for offering outstanding plumbing services to the residents of Lake Mary, FL, and their environs. The 24 hour Lake Mary Plumbing services we offer means that we always show up at the site on time, well dressed. We are also well prepared and organized to serve your home, and provide the appropriate fix to your plumbing issues as soon as possible. On arrival at your home, the issue will be analyzed, while we at the same time, determine the perfect solution. You will also endorse our work before we start. When you make use of our 24 hour Lake Mary Plumbing services, you are guaranteed that the services that will be offered will definitely surpass your expectations. When we arrive, we totally analyze your issue and clarify an ideal solution, and allow you to offer an endorsement to our work before we begin. We likewise offer installation services. Give us a chance to be your expert Lake Mary Plumber, the one in charge of providing solutions to all of your plumbing issues. You will never be disappointed. A trial will definitely convince you.